Traditionally, Buddhist philosophy has seemingly rejected the autonomous self. In Western philosophy, free will and the philosophy of action are established areas of research. This book presents a comprehensive analytical review of extant scholarship on perspectives on free will. It studies and refutes the most powerful Western and Buddhist philosophical objections to free will and explores the possibility that a form of agency may in fact exist within Buddhism. Providing a detailed explanation of how Buddhist meditation increases self-regulative mind-control abilities, the author argues that the Buddhist path is designed to produce meditation virtuosos exhibiting mind-control abilities far exceeding the free-will advocate’s ability to ‘do otherwise’ or have their choices be ‘up to’ them. Based on the empirically-supported mind-control cultivated by these meditation virtuosos, the book proposes the principle of, ‘Buddhist Soft Compatibilism’, a theory of ‘freedom of the mind’ that entails freedoms of the will, attention, emotion and action, compatible with both determinism and indeterminism. Buddhism, Meditation and Free Will will be of interest to Buddhist and Western philosophers and academics interested in comparative philosophy, free will, philosophy of action, metaphysics, ethics and Religious Studies. 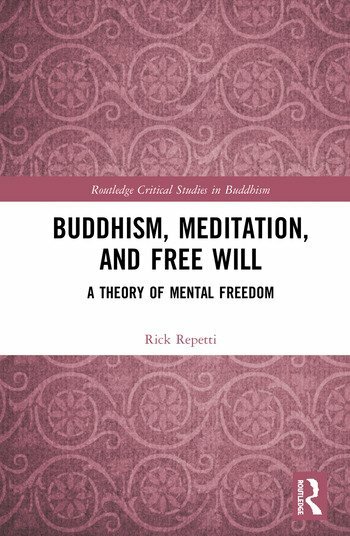 Rick Repetti is Professor of Philosophy at CUNY, USA, and Assistant Editor for the Journal of Buddhist Ethics. His recent publications include the edited book Buddhist Perspectives on Free Will (2016), also published by Routledge.